Due to their exceptional record with the BBB and thousands of happy customers, the Credit Assistance Network touts its “credit improvement” services as being best in class. The Credit Assistance Network promises to aggressively help with any problems you may be experiencing with credit, loans or debt. Rare is the company that’s this persistent about it’s approach and dedication to clients’ expectations. Under the Credit Assistance Network’s process, you begin by consulting with a credit specialist who will go over your credit report. When your enrollment has been completed, the company’s service department will decide what items to dispute and how to dispute them. Customized letters of dispute will be sent to the Big 3 credit bureaus, and based on their findings about the accuracy of the listed items, the Credit Assistance Network will then draft and send dispute letters to creditors and collection agencies. The company may also take intervention measures, which could include validation demands and goodwill letters. 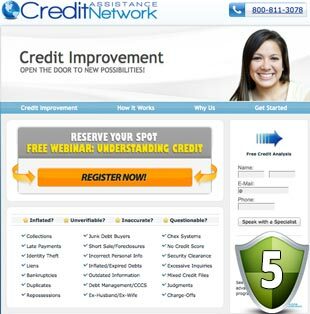 Within 30 to 45 days, you will receive updated versions of your credit reports and your case will again be reviewed. In all instances of inaccurate, questionable, outdated and unverifiable information, the dispute process will be repeated. Only when every problem has been resolved will your case be closed. What Does Credit Assistance Network Cost? The Credit Assistance Network’s programs range in price from $47 a month to $139 a month. Because no two situations are exactly the same, the company recommends customized plans that are based on your individual needs. During the course of a free consultation, one of the company’s specialists in credit, loans and debt will identify your problems and give you specific recommendations on how to proceed. And if it should turn out that you do not qualify for the company’s program, its representatives will make every possible effort to steer you to a course that suits your situation. Debt and credit specialists offer telephone support Monday through Friday from 9 a.m. to 7 p.m. EST. As for your online account portal, access is available around the clock. Real-time updates regarding your case’s progress are accessible through your account. You can upload documents there, too, and post questions for your team. The Credit Assistance Network proudly points to its record of having helped every one of its clients, and justifiably so. Happy customers are the greatest testament to the quality of a company’s services. In an economy that has seen many people fall behind on bills, the Credit Assistance Network stands apart by helping the everyday man or women make improvements to their credit. By exercising complete compliance with federal and state law and maintaining a consistently excellent Better Business Bureau rating, the company distinguishes itself as a trustworthy authority in a field where consumers can never have too many friends. You should now have tremendous confidence in this service after reading our Credit Assistance Network reviews.